VR has become a major buzzword around the videogame industry these days. For the past few E3 conferences, there have been whole sections of the floor devoted to people strapping on headsets and playing first person titles where you rock climb or pilot a spaceship. Other times you’re running in a foot race like the intriguing title Sprint Vector that I demoed at the show. Then there’s Bloody Zombies, developed by Paw Print Games and published by nDreams, which hints at an alternative future for VR gaming. On first blush, it’s a basic four player scrolling beat-em-‘up in the 16-bit mold of the arcade Teenage Mutant Ninja Turtles and River City Rampage — up to four players walk right, beating up enemies as they do with fists, kicks and various pick-up weapons. At the end of every level awaits a boss with loads of hit points and special moves. 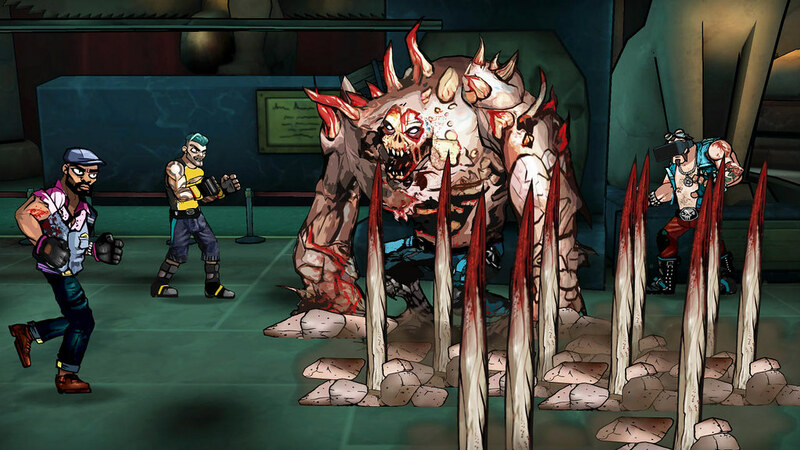 From a gameplay perspective, the game offers some variety and gameplay innovation of the beat ’em up experience. There’s a mild competitive element to the game in that the game tracks hit combos, treasure capture, and so on and ranks the player who did the best during a level. 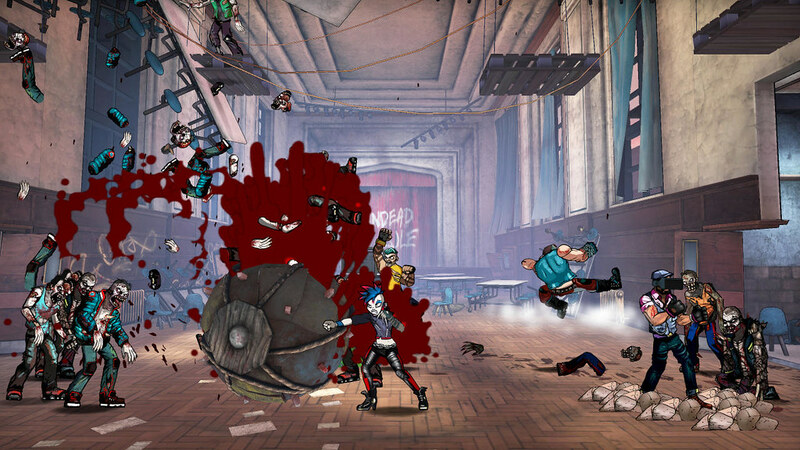 Players can “juggle” enemies by kicking them in the air, and punching them to keep them aloft, with the possibility of knocking them into a level hazard for bonus points. Every level also features hard-to-find secrets that earn bonus points, but also take them out of the main fight so they’re sacrificing treasure for combo hits. However, the game becomes a whole new experience when a player has a VR headset strapped on. Suddenly, looking in each direction reveals not only the entire level, but also things that aren’t visible when playing without it. (Amusingly, players wearing the VR headset have their characters onscreen wearing one, too.) For example, the museum level features a gigantic brachiosaurus skeleton. Without the VR headset on, only part of the skeleton can be seen; with one on, the player can see the head and neck arching over the ceiling of the exhibit. The VR set also has a more practical purpose. Since the player can see in three dimensions while wearing the headset, they can now see if their avatar is on the same plane as an enemy, always a tricky bugaboo of side-scrollers in the past. They can also see upcoming level hazards, as well as secrets. The other impressive aspect to the VR is that unlike most games using the headset, there’s no motion sickness. 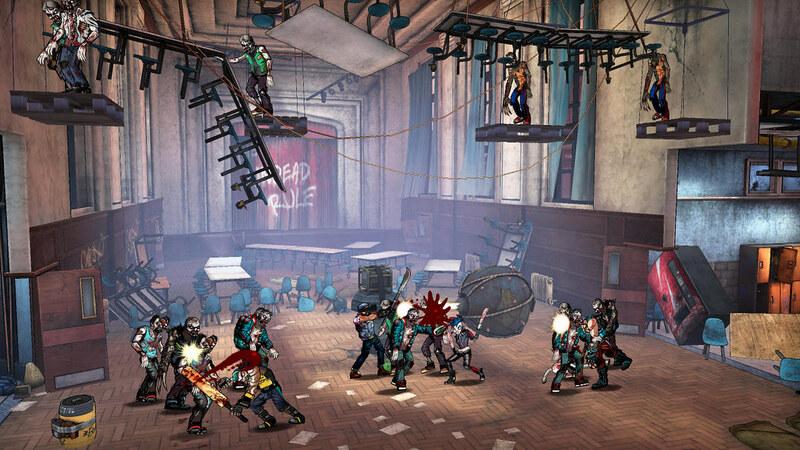 The game presents itself is presented as a model set with characters moving through it, as if playing with action figures. Developer Steven Craft confirmed that people who had complained they were extremely sensitive to motion sickness in VR games had no issues with Bloody Zombies because there was no first person queasiness to be had. 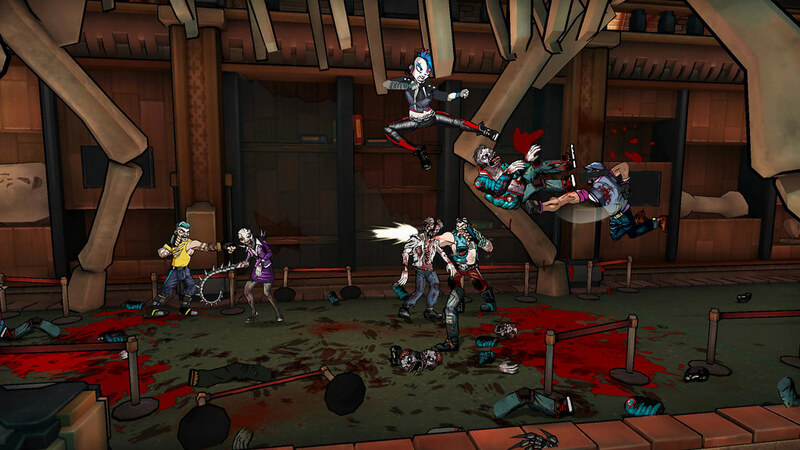 Bloody Zombies will be released on Steam, with Xbox One and PlayStation 4 versions following. It will support all VR headsets, including PS VR, Oculus Rift, and HTC Vive.